Long Island College Hospital at 339 Hicks St.
COBBLE HILL — The fate of Long Island College Hospital may soon be settled as developers, health care operators and others submit their final bids on Wednesday to redevelop the property. Bidders must present their plans by March 19 at 3 p.m., after which committees made up of state officials and community representatives will decide on a proposal during a seven-day selection process. “I’m confident that the process can work to keep a hospital,” said Jeff Strabone of the Cobble Hill Association. Labor unions and community groups have long sought to keep a full-service hospital in Cobble Hill and have derided any plan that sacrifices the LICH property for condominiums and reduced health care facilities. ► When did this fight over the hospital begin? The State University of New York in February 2013, voted unanimously to close Long Island College Hospital. 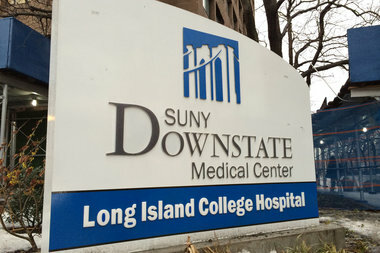 SUNY’s board of trustees made the decision after Dr. John Williams, the president of Downstate Medical Center, which operates LICH, recommended that the hospital close because it was imposing heavy financial losses on the Downstate system. Officials have said SUNY is losing $13 million each month at LICH. ► But the hospital didn’t close? No. SUNY’s decision saw massive backlash and criticism from hospital employees, neighborhood residents and local politicians, all of whom demanded that state officials find a way to save their hospital. The fight, which also included court orders that prevented SUNY from closing the hospital, culminated in April 2013 when the state withdrew its plan to close LICH so they could work with the state Department of Health to figure out a solution for the hospital’s future. ► Who are the people fighting to keep LICH as a full service hospital? The LICH coalition includes community groups, the New York State Nurses Association, 1199 SEIU Healthcare Workers East and elected officials. SUNY and the state DOH had to answer before a Brooklyn judge for their alleged attempts to shutter LICH after hospital supporters accused the state of violating court orders. Last month, a settlement was reached between both sides on LICH’s future. ► What does the settlement do? The settlement opens the door for new bidders to take over the hospital. Each proposal will be scored on its "technical" offerings, like medical services, which community representatives and state officials will score, according to the court's ruling. Offers will also be scored on their financial viability, which the state will determine, but the technical score carries more weight. While the settlement states offers that include a full-service emergency room, an intensive care unit and in-patient beds will receive a higher score, it doesn’t guarantee a full service or teaching hospital for the LICH campus. Officials are also leaning towards bidders that can maintain health care operations at LICH during the transition period when SUNY will hand over the property to its new owner. Roughly 600 employees, including nurses, doctors and hospital employees received layoff notices as a result of the settlement, SUNY spokesman David Doyle said in an email. The layoffs served to align "staffing levels with patient volume and currently available services, which will not change" and were in accordance with contracts of affected bargaining units, Doyle said. ► So has Long Island College Hospital been saved? That remains unclear. In the past, only one developer had previously proposed a full service hospital for the LICH property. Community groups have met with some prospective bidders and confirmed that at least three teams will propose hospitals for the Cobble Hill campus, sources familiar with the meetings said. Other proposals from Fortis Property Group and the Brooklyn Hospital Center have included urgent care facilities and “freestanding” emergency rooms with only a few beds and bays. Prime Healthcare Services met with community members last week and expressed an interest in LICH, according to reports. The controversial hospital chain is under investigation by the U.S. attorney and would be the only for-profit hospital operating in the city if it took over LICH, Capital New York reports. But if a new operator isn't found, SUNY will give up control of the hospital in May 2014 and LICH will close.